Weddings Costs > How Much Does a Bartender Cost? How Much Does a Bartender Cost? A bartender may be required for an event such as a wedding, retirement celebration or birthday party. The bartender generally works on their own, but he or she may also be contracted through a company. The bartender is going to help serve drinks, set the bar up, keep the area clean during the party and do any other tasks any other bartender would do that’s found at a local restaurant/bar. The cost of a bartender will depend on how many people are going to be attending the party, the date of the event, geographical location and individual/company you choose. Most personal bartenders will want to serve 50-75 guests at a maximum, so for every 75 guests, you will want to factor an additional bartender. On average, expect to pay anywhere from $15 to $50+ per hour. Most will require you book in four-hour increments. These rates can be 30 to 50 percent more if planned on a holiday. For those who go over the increments, a bartender will charge $30 to $75 per hour in overtime fees. Keep in mind these prices will not cover the alcohol. Most bartending services will offer discounts for each additional bartender. For example, you may get a five to 10 percent off discount for the second bartender or a 20 percent discount for a third bartender. Every company and individual will have their own billing policy. Weddingwire.com has many forum members chiming in on this issue. One member said she charged $300 for five hours, while another said they paid $14.25 per hour. What is going to be included in the price? The bartenders, as well as liability insurance, should be included in the price quote if you hire from a reputable company. They should also be certified with the local county/city. Most bartenders will come equipped with their own gear in order to serve the drinks. Some of the gear is going to include ice buckets, a corkscrew and bottle opener. Also, some companies may include a “bartender in a box” package, which will include everything from the drinks to the supplies. These types of packages tend to cost a bit more than just a bartender who shows up to serve the drinks. Before the event even begins, a good bartender will be able to tell you how many drinks you will need and will also be able to offer drink recipes that may relate to your event. These bartenders should have a great personality that meshes well with your crowd. The largest extra cost of hiring a bartender is the alcohol used to make the drinks. Remember, the quotes mentioned above won’t include the cost when hiring a bartender. Each additional bartender is going to cost more. Every company is going to vary on what its bartender to guest ratio is. It is best to inquire with the company to see what they recommend. Some bartenders will do more than just serve the alcohol. Some will even service your guests by serving food and walking around the venue serving drinks. Tips will not be included. Most bartenders will expect a tip ranging anywhere from 5% to 20% of the total bill. While optional, it is always best to tip. An upfront payment will be expected before services are guaranteed. This upfront payment can about 50 percent of the final total. 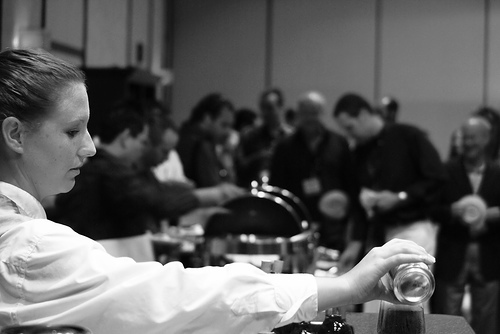 An open bar can often be easier for a bartender to work since they don’t have to charge and collect money. What does an open bar mean? Typically, it’s a bar found commonly at a wedding reception where drinks are served for free. Before hiring a bartender, see if they are insured. Be sure to check with your venue to see what their bartending rules are. Many venues have rules that require you to hire a bartender who has the appropriate insurance and certifications through the city. A good bartender can get booked up fast. It’s recommended you reserve your bartender a few months ahead of time to make sure you can secure them for your event. How much alcohol should you plan for a wedding? First, it’s going to depend on your bar option. Will it be an open or cash bar? To put it in simple terms, you should plan on each guest drinking at least two drinks during cocktail hour and one drink per hour for every hour after. So for example, if you were to have 150 guests, you could go through 300 drinks during the cocktail hour alone. If the wedding were to last five hours, this would be an additional 500 drinks. To budget properly, you would need about 800 drinks to supply your wedding party comfortably. Some bartending services may offer discounts to non-profit organizations. Inquire with the service to see what kind of discounts they offer. Compare at least three bartenders in your area to see what they are charging and have to offer. You may not need a professional service to help you with the event. Instead, consult with a friend or family member who may be able to help. Instead of paying $300, you could pay them $50 to $100 instead. Consider placing an ad on Craigslist to see if anyone is qualified. Oftentimes, people will be more than happy to do the job for a few hours. Talk with local bartending schools to see if any new graduates may interested in the job. I had reserved one bartender for four hours for a local event. He charged $40 per hour. Seems to be on par with what I read here.